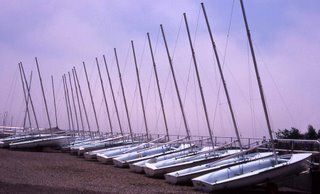 I remembered this photo of the sailboats with sailing season starting. We have a maritime school here in Duxbury. It's fun to see all the young sailors out in the bay in these boats. It's a picture I haven't yet been able to capture, but I did get the sailboats at rest. I really like the way this photo keeps my eyes moving. Even though the boats are all pretty much the same, I stop and look at each one, begining in the LRHC. So many images fail to keep the viewer's eye interested in the photo. Your photo keeps me interested with out being busy. Good work. yes, great lines, and I love the purple sky! Thanks, Ben. It was good to hear from you.